CU by Day: CT Spot and a Layout! So now that I'm not making pu kits anymore, I needed a ct to keep me scrapping. Lucky for me I stumbled on a ct call from one of my favorites and an old internet acquaintance, Ramona of Memory Clips designer and owner of Brownie Scraps. She does beautiful kits that are so versatile and fun! Not only that, but she sells from my old digs ScrapMatters where I'll be hanging out anyway, AND she sells templates from her own Brownie Scraps store! 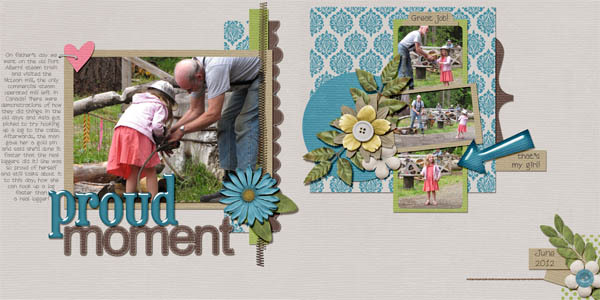 She was kind enough to have me on her team and so of course I dove in, downloaded a kit and some templates and stayed up until the wee hours scrapping some pics from last father's day. What a fun kit! This one's called Oopsie Daisy and is technically themed for bumps and owies and kid oopsies, but since I didn't have any appropriate pics I scrapped out of theme with these cute pics of my dd getting to assist in a demo of old time steam logging. Thanks for reading and ttys! !